Our Bing Ads research team has joined with Performics and Northwestern University to help understand consumer intent by looking at the psychological motivations behind search query language, with a goal of helping customers optimize their advertising. Knowing the competitive landscape is critical to staging a successful ad campaign. 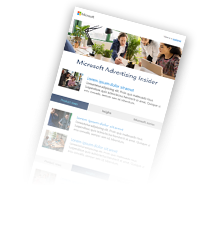 Bing Ads helps you get valuable insights and actionable recommendations so you can stay ahead of the competition.